We have a collection of 28 different types of Comfort Food Sandwiches and Comfort Food Burgers. Nothing like a delicious Grilled Vegetable Sandwich which can be eaten for breakfast or snack/starter. A generous amount of grated cheese on top makes it more tempting! You can put your choice of vegetables to make it sumptuous. It is equally loved by kids and adults. The Indian Railways Veg Cutlet Sandwich is a trip down to memory lane for those who travel by Indian Railways. It is a comfort travel food that warms the souls of travelers across the country! While you talk about famous roadside snacks of Mumbai, sandwich generally ranks numero uno. Full of josh, this all-time favourite street food of Mumbai features an assortment of crunchy and juicy vegetables sandwiched between bread slices smeared with butter and peppy green chutney. A special sandwich masala is the highlight of these sandwiches. You can either have the Vegetable Sandwich or opt for a Veg Toast Sandwich garnished with crunchy sev. These sandwiches can be enhanced with the addition of processed cheese. One of my all-time favorite is the Toasted Samosa Sandwich that combines two of my favorite dishes to create a lip-smacking, scrumptious snack that boosts with flavours. Samosa Chips Sandwich an exciting combination of crunchy chips, samosa and cheese that is filling and a sandwich worth trying. When you are in a rush, everyday ingredients like cabbage, carrot, mayonnaise and paneer will come to your rescue! The Cabbage, Carrot and Paneer Grilled Sandwich and Quick Coleslaw Sandwich uses the simplest of ingredients but still has a wonderful texture and appetizing flavour, because the ingredients work so beautifully with each other. Craving pav bhaji? It’s not always about elaborate preparations. This simple and quick recipe of Chat- Pata Pav made by tossing vegetables in desi masalas and stuffed in a butter-laden laddi pav will surely delight you! Another similar preparation is the pav bhaji burger that you can pack in an aluminium foil and give it in your kid’s lunchbox. Leftover pav bhaji can be transformed into a tongue-tickling Pav Bhaji Sandwich, which is delectable and filling. 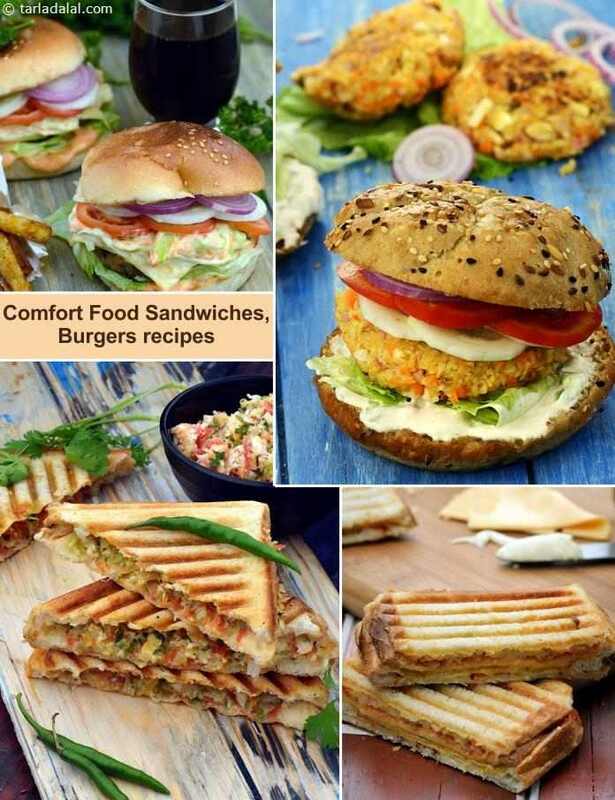 A simple aloo tikki or mixed vegetable patty (cutlet) can be placed between a burger bun with crunchy lettuce leaves, onion and tomato slices to create delicious Vegetable Burgers. Health conscious people can make use of tava roasted cutlets with whole wheat burger buns and a low-calorie sauce to make a Healthy Burger. Just like open sandwiches, you can make open burgers too. Open Vegetable and Corn Burger topped with colourful veggies and juicy sweet corn bound in white sauce and generously sprinkled with cheese is gooey, melt-in-the mouth and will be loved by all. We would love to have your feedback on our collection of Comfort in the comments section below.